Since this is so late, I’m going to somewhat use hindsight; however, I’m going to be honest with what I thought was going to win at the time (for instance, I would have put money on My Little Pony: Equestria Girls winning the Ursa Major right until the end). However, back in November, it became clear that Frozen was going to take the two animated awards (I don’t think anyone could have predicted how unfurry the furry award would get). For the record, it’s a boring movie, and the fact that both the Oscar and the Ursa Major have gone to movies trying to eat their cake and have it to on the “feminist” Disney princess thing is pretty much the saddest outcome ever. At least it wasn’t an upset this year at the Oscars. Note: Please remember these are my November 2013 guesses. Okay, if Frozen was such a terrible movie, then how did it become the frontrunner pretty much overnight in the animated race? Well, let’s face it, last year was pretty weak. Pixar had another sequel out, and apparently the Academy will have nothing to do with Pixar sequels that don’t have the words “toy” and “story” in the title somewhere. It didn’t exactly go over well with the critics; it was a pretty average movie, in the 70s on Rotten Tomatoes. Not by any means awful, but more, meh, whatever. The Academy has recently had a rocky relationship with Pixar; Cars 2 came out, and the Academy made it clear, just because they were Pixar, that did not mean they would take any crap from them. The next year, Brave came out and won the award, which seemed to be the Academy saying, okay, no crap, but your wet farts are perfectly acceptable. Let’s be clear here; the Academy had no business nominating Brave; it’s nomination cost <The Rabbi’s Cat the chance to go to the show, meaning 2012 was the first year since 2008 that an originally foreign language film was not nominated. Now, if they actually revealed the nominating votes, I’d bet The Pirates! Band of Misfits would have come in last of the five nominees, but it was also a, you know, half way decent movie that deserved to be there (and technically even foreign, though still English with a wide American release). Then, Brave became the first upset winner in the category, though I guess that does depend on your definition of “upset.” Some found Happy Feet over Cars upsetting, but not really surprising, which is the definition I’m using (though Brave covers both upsetting and surprising). Since the upset came at the expense of Wreck-It Ralph, this may have had a factor in the season. Many people weren’t exactly thrilled with Brave’s win, and the Academy has been known to give “make-up” wins in the past over upsets. I don’t think that’s the case here, as, technically, it was a Disney movie upsetting a Disney movie; okay, so it was Pixar/Disney over Disney/Disney, but John Lasseter is going to end up in the credits as some kind of producer in both. It may have been a factor in Monsters University’s no show, but the Academy just really doesn’t like sequels. The truth of the matter is that there were no major competitors, period, from a major studio when Frozen came out in the animated feature department. It was just a lousy year. I’m a pretty big fan of animated movies, but my top ten list for the year had one animated movie, and it wasn’t even eligible, much less a factor. It could have been the year Ernest and Celestine or The Wind Rises became the second originally foreign language film to take the trophy, not because those were two of the greatest animated movies of all time, but because they finally ran out of English options (the fact that those two became the first two movies nominated for their non-dubbed versions should tell you something). Unfortunately, Frozen came in just at the right moment, and was okay … ish. I mean, to be clear, I somehow managed to avoid any really bad movies last year, with the exception of Epic (and even it was just bad, not really bad). 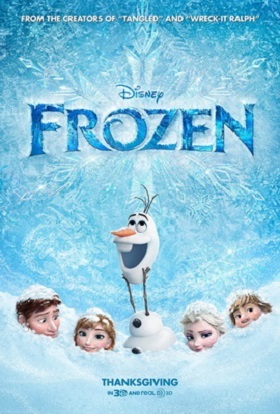 Frozen was just really, really boring, and that’s why I picked it as second worst movie of the year. The kind of boring, apparently, that people like, however, so it also became a bit of a phenomenon during an also pretty boring winter movie season, animated or otherwise. It squeaked in their at the right time, is all. I personality think Frozen is overrated to me, at least in personal opinion instead of legit critique. Only movies I can like is (really depends) horror, humor, and epic action adventures (e.g. Guardians of The Galaxy, Man of Steel, and some others). Also very rare: Some animated movies like Wreck it Ralph, Alpha and Omega, Shrek, etc. I may SO be stepping out of line here, as I am a member of the Ursa Major Award administration, but... I am also of the strong opinion that Frozen was highly over-rated. I mean it WAS Good, BUT... geez people. The fact that it was not only nominated for an Ursa Major Award but actually WON (Best Feature) continues to blow my mind. True, we had a dearth of good furry films in 2013, but there was definitely more furry stuff than Frozen. This year, so far, is almost an embarrassment of riches in comparison to last year. The really odd thing was last year, Wreck-It Ralph didn't even make the recommended list, which also had about as much business being there, but seemed like the sort of thing that would at least be on the list; it seemed like a reaction to criticism from a lot of people that our furry awards could be, you know, a bit furrier. And then this happened and I'm back to square one. My working theory, however, is that since I actually liked Wreck-It Ralph, it was obviously too smart for most furries. Though that just may be my ego talking, because, come on, it was Wreck-It Ralph. I liked "Wreck-It Ralph" a lot also, but come on! Where are the furry characters in it, unless you count the live video-game characters in it as anthropomorphic? Q-bert, a Pac-Man ghost, and a couple of others make walk-on appearances, and there is a statue of Sonic, but it is not really a furry movie. That's what I'm saying; there's no consistency. They're even by the same company; a statue of Sonic actually puts Wreck-It Ralph slightly above Frozen on a furry scale(basically infinitesimal versus infinitesimal...er), above and one isn't even recommended, while another wins (and of course it's the one I don't like)? It's not so much overrated, it's what scale are we rating them on? Just for the sake of accuracy: Wreck-It Ralph was eligible for 2012 (when it came out), not 2013. For me personally 2012 was another you've-got-to-be-kidding-me year, when Brave won out over Madagascar 3. By a wide margin.